Property 1: Watch the Whales from comfortable penthouse apartment! 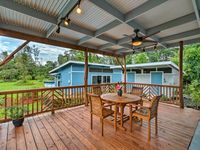 Property 5: "THE ARECAS" a great place in a Beautiful Hilo location! Property 11: Tropical Paradise On a Budget! 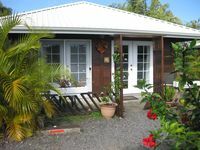 Property 17: Oceanview Hilo Studio w/ Elevated Covered Deck! Property 18: Tropical Studio Apartment! Property 19: Rain Forest Apartment! Property 25: OUR AREA IS NOT EFFECTED BY THE RECENT VOLCANO - THE PERFECT OCEANFRONT RETREAT! Property 32: Amazing Ocean, Grand Sky, and Hilo Views. Spacious, yet comfy. Property 34: Keaau Apartment on Beautiful Acre w/ Pool & Deck! Property 48: NEW! Hilo Studio w/Patio Near Downtown & Beach! Property 50: Best little cottage in town! Even with rain off and on, we had a great stay. The garden is lovely, very neat to see the coffee bushes bearing flowers and berries and then try coffee brewed from the them!